We the people of the United States, in order to form a more perfect union, establish justice, insure domestic tranquility, provide for the common defence, promote the general welfare, and secure the blessings of liberty to ourselves and our posterity, do declare and certify that “We”, that singular entity that constructs this national body, be deemed legally insane. Yes. This national entity, America, has gone off its Collective Crumpet. But let me back up a space so that we can examine the “self” that was, in order to make the situation clear. This nation was born a breed of fighters. We were, by the very nature of our inception, fighters against oppression, even though at times we have been the oppressor. We came out of relative safety and comfort of civilization to stretch our legs, to breathe in deeply the pure, rarified essence of Earth as it was intended. It was raw, relatively untouched, it was indeed a New Earth. We fought disease. We fought the Elements. We fought starvation. We fought a wild land and we fought against natives who took umbrage at our assumption this was our wild land for the taking and taming. And eventually we fought against the would-be Lords who followed us here to try and retain and expand their position of power. We fought. Side by side, we fought these common enemies. It gave us a sense of solidarity, to have fought so many battles together. We knew each other, we trusted each other. We expected each other to be there behind, ahead, and beside us. And we expected each other to be capable of being very, very dangerous. It’s what we wanted in compatriots. We wanted each other to be dangerous. In the decades and, dare I say it, centuries since our initial birthing pains, we have alternately saved and wounded ourselves with that element within us – the ability to be rough, to commit acts of violence in defense of our basic Human Rights. In the meantime, our population has changed. Initially we were made up of the inherently strong, those with a taste for adventure, with a yearning for a raw, close connection with the earth that gives and takes life. As those struggles were overcome, our strength was redirected to those who followed. We received “your tired, your poor, your huddled masses yearning to breathe free, The wretched refuse of your teeming shore”. We have received them, adopted them, and integrated them into the “We”, that we stood so proudly for. Many of those were not made of the same sort of stuff as the pioneers to this land. But that’s not to say they were helpless or useless. They came with other qualities critical to a healthy society. They came with a cool intellect, with an empathy for the wounded. They came with an understanding of healing, and of arts, and of industry. And Always, Always they came with those who would be Lords of us amongst them. Together we fought against exploitation. In some places the two of us meshed beautifully. The Fighter and the Nurturer, the Explorer and the Industrialist, the Hunter and the Farmer found a symbiosis. We struggled to learn to love each other. Like brothers and sisters we fought and lived together. But somewhere in there we went insane. Some say it was the Industrialists that ruined us. Some say it was War – the Civil War, the Indian Wars, the Great Wars, etc. perhaps. Some say it was the would-be lords, who have intentionally driven us insane to make us pliable to their form of control, a certain parasitic existence. Some blame the paranoid fierceness of the fighters, or the utopian optimism of the nurturers. Some blame God. Some blame the devil. And some say it is The Gun. Some are saying, and have been saying, that our penchant for violence offends one of our fundamental tenets of existence, the right to a peaceful life. They say that we can no longer be trusted with our weapons, that we are as likely to harm ourselves as to protect, and that in this time of comparative peace we should renounce our weapons as the tools of a past, uncivilized society better left forgotten. It’s a fantastic dream, to believe that the elements are tamed, that killer diseases are conquered, that evil and opposing forces are spent and have laid down their arms. But it is a fantasy of a softened populace who no longer feels the harsh realities of tyranny. They believe it is no longer possible for tyranny to exist, or alternatively that it cannot be fought. This illogical paradox of conflicting dreams lives in a protected world where our defenders are anonymous, predictable, and infallible robots that require no thought, maintenance, or relationship from us, leaving us free to nurture the illusion of personal relationships with people we’ve never met, while sitting side by side with others we’ve never met. We formulate new rules based on what we want, rather than in what is right. It is also a fantasy to believe in the heroic scripts of personal vengeance and victory that are fed to us through Hollywood stories. We dream of accolade, rather than the simple function of self-defense. We imagine ourselves in a CGI world where we can pick up a new cache of weapons and/or ammo by walking into just the right spot hidden in a wall, and that our weapon lasts forever, lives can always be restored, and that will rat-case scenario we can load up a backed up character. We fight solely for glory, and entertainment. We’ve forgotten what it means to defend. And through these delusions – of grandeur, of peace, of manipulatable relationships that can be crafted like unspeaking clay, we have gone quietly insane. We are awakened startled from our dreams of a homogeneous, nurturing society by the sound of gunfire, and are angry at our defenders for not having protected us from the unwatched door. The defenders stand furious, disarmed and distracted with trying to satisfy the irrational expectations of protecting and nurturing simultaneously. Our path back to sanity is an ugly one. In fact, there is no path. We lie at the bottom of a ravine, scratched, broken, and bleeding, screaming incoherently at figments of our imagination, demanding to know how we fell off the path. But we know where the path is. Up there, following the marks of broken branches, loosened rocks, and shifted soil through which we fell, lies the path we were on, and to where we must climb back up, to create a place where equality is a measure of respect, not bank numbers, where delusion is considered an enemy to be shot in sight, and humanity – real, honest humanity, is both protected and nurtured. It is not the fighter nor the nurturer that must be assailed. We cannot start dissecting ourselves without bleeding out. It is the delusions of our society that must be rooted out. The cold air has reached my core, through the layers of leather, and wool, and the copy of the free nickel ads I put underneath my leathers against my chest. I didn’t feel cold yet, but the cold was there, wooing me with its last breath against the blooming morning. I only recognize its intrusion when I dismount the bike at an old building adorned with old stuff – a wagon wheel, a giant set of spurs, horseshoes nailed to the exterior wall. The smell of winter road-dust, kicked up by my exhaust, greets me as soon as I pull of the mask protecting my face from the wind. I survey the cafe front, first as a way in, and then as is my habit, as a way out. It will do for both. There’s a television in the place where I’d have expected an open fireplace in a different town. A fishing show drones on about lures, periodically trying to excite its audience with dramatic music, quick, flashing clips of action and breathless exclamations. By the interaction of the other diners, it’s only real purpose is to not be the noisy, jangling prattle of big city culture. Three old geezers, ensconced in their morning Conference Table across the way from me, are holding audience with some out-of-towners seated next to them in the corner. One of them is explaining the architectural wealth of the town, describing in some detail the historic stage coach stop. It was almost as if he’d been perhaps one of the stable boys, so rich was his memory of it. The other two nodded in agreement with the ancient wisdom, and the travelers listened, wide-eyed, completely caught up in another time. I started to smirk a little inside, knowing full well that, as old as he was, it was highly unlikely this codger had ever seen a functioning stage coach stop. But I didn’t think harshly of him. This is how tales are told in the thousands of Small Places. I left them to their morning reverie, turning my attention to the building itself, which was busy trying to get my attention, wanting to tell me a similar tale. Dark stained pine boards lined the room, rough-sawn, worn smooth by backs leaning against them, thighs and shoulders, wiggly child hips squirming in their seats, jackets tossed, purses and bags stashed against them, each one adding to the Tale of this cafe. 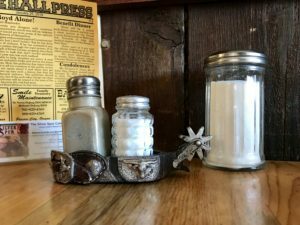 A pair of horseshoes clinched the Pine frame together around the air conditioner, shelves built over the windows held antique relics to bemuse diners as they waited for their orders. But there were neither all that many relics to be pondered, nor all that much time to ponder them. A quiet waitress with a disarmingly comfortable smile knew already what I wanted, and merely waited patiently for me to say it. She was pouring coffee. The ordered food seemed to materialize in a matter of moments, and I was already starting in as the travelers gratefully thanked the codgers for the visit, and their troupe swirled out to the bustling cacophony of thank you’s and have-a-nice-days, the sliding ring of the cash register, the sudden thudding silence of their absence as the door pulled shut. When it settled, the old codgers got back to business. And by “business”, I mean aches, pains, the latest deeds of stupid local kids, and recounting of the winter of ‘62, as contrasted by this one. The Pine boards all around me seemed to nod their agreement, the semi-circular sawmarks standing out as a testament. There is little to say here in this place that can match the mesmerizing entertainment value of the national news networks. There is little use in them trying to compete for the slick, sophisticated story-manufacturing that happens in the cities, where every aspect of people’s lives is artificial. The stories of these folk may not always be true, but they always satisfy my worry for humanity. Here, in these dusty places, live people with real things to do – ranching, logging, farming, feeding geezers, and entertaining strangers. I love these people. I don’t know why, but I do. As the three codgers break up their morning committee meeting, one tips his hat to me across the gulf between us. And with that simple acknowledgement, there is no gulf between us. I nod back, he tosses cash in the counter the waitress will find when she comes back out from the kitchen, and the three file out to their respective vehicles, explaining their day’s plans to one another even bough they all already know. There is a lot of open road between here and my destination. The sun, doing its best from its shallow angle of winter, brightens but only slowly warms the outside. The door, ever-exuberant, squeals again as I depart, accompanied by the tinkling sound of a spoon in a coffee cup behind me. The sounds shift, the diner’s quiet scrum of people gives way to traveling sounds. A semi-truck lumbers it’s way through it’s gears from the town stop sign. In a few minutes, I will be passing this truck as it labors up the grade northbound. The sudden, confident roar of my exhaust moves my mind to these matters of the road. But I’ll be back someday. And when I return, it will be like a homecoming. That waitress will recognize me. Those codgers will, lord willing, be sitting there, probably telling the same tales to new travelers. If ever you find yourself looking for a home, this place – and the thousands like it – are here and waiting to take you in. Come as yourself – come honestly – and you will find yourself at home.